Some of you know that I attempt to quilt. I am self taught. So as a result my skills are sketchy at best, though I enjoy doing it. I must tell my story of beginning to quilt. My inspiration is Xena Lee Wheeler. When I was in college I would to go to church at the Wheeler's house. In their house Xena Lee almost always had a quilt in a quilt frame under construction. As a result I began to say when I have time I will learn to quilt. Well, Sam a few years ago removed all my excuses by giving me a beginner kit. As a result I made a quilt which Sam got. Each square taught a different skill. So that is how my quilting adventure began. That brings me to these two items. I have joined a quilting class. It meets once a week and we do different projects. It is really cool to have someone to show me how to do things properly, to suggest what foot to use on the sewing machine and other people to talk to as well. The ladies range in age from my age to our teacher who is almost 70. 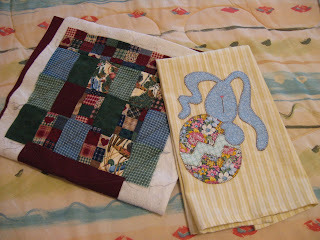 It is fun to meet all different kinds of people and enjoy quilting while I am at it. I caused a bit of a tisey in my first class with my blue bunny but I think it turned out nice. The project in process is going to be bag/purse and I intend to make one in summer colors that is bigger. I will post the finished results. This is the first time I have used the sewing machine to do the quilting. I must admit it feels weird. The April project is to be a turning twenty quilt. If all goes well it will fit a twin bed.